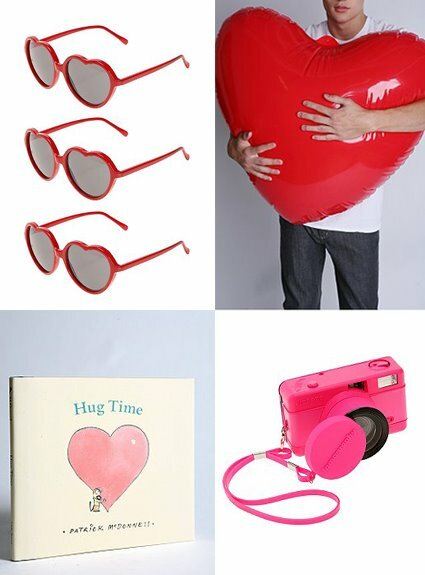 Random Valentines Day kitch from Urban Outfitters. I actually kind of want that big heart, I’m not sure why. I am truly in love wiht the pink camera. I will put that on my honey list. I always give a book to my daughter for Valentine’s Day and I picked up that one at a local store here- it’s darling!! I work at Crooked Monkey funny t-shirts and this valentines day we are having a Valentines Day Poem Writing Contest. Send in a funny romantic poem and enter for your chance to win a free t-shirt for yourself, significant other, and a free dozen roses. Yes! I love VDay kitsch. my parents sent me a massive heart like that to my office last year. it still is on my desk and makes me happy every time i look at it. love your blog, btw…care to exchange links? Have you seen the Smittens at Restoration Hardware? They’re on clearance and so cute! Haha, this is making me smile!